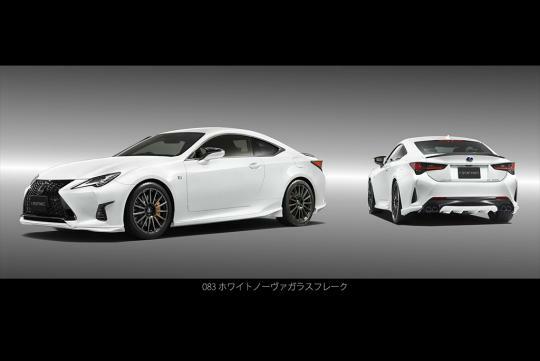 Lexus has introduced a TRD (Toyota Racing Development) bodykit for its sports coupe, the RC F. The parts will only be available in Japan. The bodykit consists of a small front lip, new plastic aerodynamic fins below the headlights, new side skirts, rear diffuser and a rear lip spoiler that is made out of carbon fibre. TRD mirror covers have also been fitted to the car. Completing the look of the car are a set of of 19-inch forged aluminum wheels that measure 19×8.5 at the front and 19×9 at the rear. For those who care less about aesthetics, TRD has also released a new sports muffler, steel bracing under the body and a new performance damper brace for the rear.